There are so many great things about homemade facials! If you pick the right ingredients, they can be much more effective and better for your skin than the shop bought equivalents. This is for two reasons, firstly the ingredients are going to be much fresher and therefore more potent and secondly because you won’t be adding any filler ingredients or preservatives, and really, what’s the point in having filler ingredients when you don’t need them? While it is always lovely to go and have someone else give you a facial, it can be very expensive to get a good one and also needs to be organised and planned around in advance. The best part of home facials is that you don’t have to go out into the world immediately after. You can let it set in at home while having a bath or watching some trashy tv and not ruin the fresh and clean feeling with the exhaust and fumes out in the world immediately after! We all know that avocado is super healthy and a great source of good fat when eaten but it’s also awesome to apply on your skin as well! The oil in avocado is great for hydrating the skin and particularly for people who are prone to dry skin or eczema. It naturally minimises lines on the face and reduces the appearance of age spots! It’s full of antioxidants and can act as a remedy for burns as well as being an effective sunscreen (yes really! If you google it, heaps of homemade recipes will pop up)! Oats are great for so many things inside your body and out. In this face mask, they act as an exfoliant gently removing dead skin without the harshness of a lot of generic shop-bought exfoliators (they don’t damage the skin that isn’t already dead). Oatmeal is also hypoallergenic and contains both anti-inflammatory and anti-oxidising properties which makes it great for all skin types! Apple cider vinegar contains alpha hydroxy acids which are good for exfoliating and removing dead skin cells but also for toning the skin, it is slightly acidic and balances out the pH levels in the skin that sometimes gets messed up with all the makeup and other substances that our skin is exposed to. It also acts as an antiseptic which helps to clear blemishes. The most important thing to keep in mind about apple cider vinegar is that not all apple cider vinegars are created equal. You really need to fork out a little extra for one that contains “the mother” which is the cloudy stuff at the bottom of the bottle. The “clean” stuff is filtered and consequently loses most of the benefits contained by the bacteria. It’s always good to go sparingly with acidic ingredients as too much will dry out the skin. In this recipe, if you put a lot in, it can make your eyes water when you have the mixture on your face. Also, if your skin tends to react to harsher ingredients be careful with apple cider vinegar, you can always leave it out (the rest of the ingredients will still make a great facial). If you’ve read my previous post Bee Happy with Honey you’ll know exactly how I feel about honey! Honey is great for preventing breakouts as it is an antibacterial and therefore is great for acne prone skin. It also locks in moisture meaning that it acts as a cleanser and then seals the cleanliness in! 1. 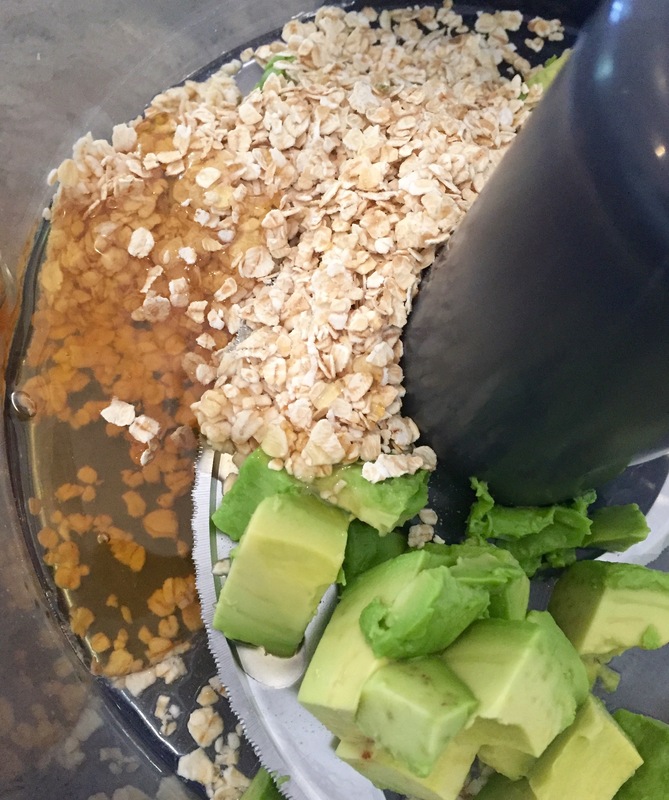 Combine all the ingredients in a food processor and blend until mostly smooth. You want the oats to maintain a bit of shape so that they can exfoliate properly! It will produce a fair bit of mixture, enough for 3-4 face masks depending on how thick you make it (the perfect amount to have a couple of friends over for a movie night). 2. Start by drinking a glass of hot/warm water which will open your pores up to allow for maximum absorption, then cleanse your face either with a natural cleanser or light exfoliant. 3. Apply generously on the face avoiding the eyes. It can take a bit longer to apply depending on how thick or thin your mixture is (which depends on how ripe your avocado is and how runny your honey etc.). 4. Leave for 15-20 mins (you can leave this all natural mask on for a bit longer than commercial products). 5. Wash off with warm water. I like to put this facial on before a bath or shower because it makes it much easier the take off without making a mess. 6. Enjoy how soft your skin feels! This mix is one of my personal favorite. All four ingrediants are so amazing for so many things and delicious too!